Two years after graduating from college, my husband and I had student loans and a mortgage payment. However, we had no credit card debt, no automobile loans, and no other debt hanging over our heads. We patted ourselves on the back, congratulating ourselves on only having “good debt”. The more you live, the more you learn. 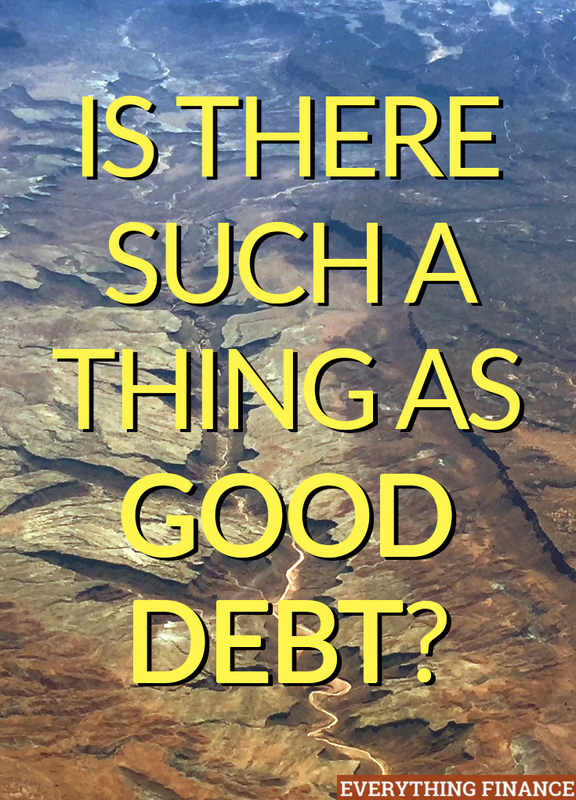 Through the years, we’ve sometimes wondered if good debt is real, as we’ve struggled to pay our loans and still afford the life of our dreams. Student loans and mortgages are sometimes referred to as “good debt” because they’re investments in your future. Student loans help you afford an education so you’re eligible for higher-paying professional jobs. Taking on student loan debt should help you earn more money in the long run. Mortgages are sometimes called “good debt” because they help us afford to buy property. Despite the housing bubble in 2008, property is generally a solid investment, so the money you pay into the mortgage grows steadily. However, even “good debt” has drawbacks. Let’s look at what those drawbacks are and how you can work around them. When you take on any type of debt, you accept a level of risk that you can pay that debt back. Your budget and income level might seem solid now, but mortgages and student loans are generally long-term debt. Will you still be able to afford that debt in 5 years? What if you lose your job? Therein lies the risk. I never put much thought into how much I was borrowing to finish college. After all, once I had started taking out loans, I basically had to attend the next semester or be on the hook for paying back my loans. So every semester, I took out what I needed in order to stay in school. I received no counseling (nor did I seek it out) to understand how my future student loan payments were growing with each new loan package. For some students, what seemed like a good idea turns into a nightmare post-graduation. Once out of college, they realize that many of the entry-level jobs in their field simply don’t pay enough to live comfortably and cover the minimums on their student loan payments. These students end up living with their parents after college, taking on part-time jobs, and/or holding out for a higher paying job (which may never come). The same thing happens with mortgage payments. All too many young couples scrape together a small down-payment and then purchase the most house they can afford. They reason they’ll get raises and promotions and the house will become easier to afford as time goes on. They move in to their dream home, only to find a nightmare brewing. Things need fixing and there’s no money for it; every cent is committed to the mortgage payment. Years later, their income has grown, but so has their family. The young couple is struggling to make ends meet. We all have life dreams outside of our careers. Maybe yours is to travel and see the world. Maybe you long to start a family. Maybe all you’ve every wanted is to run your own business. These dreams might still be well within your reach, but they might also be more difficult because of the “good debt” that you took on. Goals usually cost money, but with bills to pay, you may not be able to save up. In order to keep your good debt from overwhelming your life, you need to plan early and plan often. Consult your wiser friends and family (and if you don’t have them, see if you can find a professional). Understand how to build your budget to account for your dreams. If you’re still in school, it’s important to research your realistic starting salary and how your growing student loans will affect your ability to make ends meet. These wise counselors can help you stay accountable for all the little things. If you’ve never owned a home, you can’t possibly anticipate all the places your money will go. Ask friends and family for their horror stories or their wish-I-had-knowns. Using this research, you can be sure to avoid the same pitfalls. I’ll give you one for free: homes are usually sold with the window treatments. All too often, sellers will remove most of the window treatments before listing the house. You might move into a home that doesn’t have any curtains in the bathrooms or bedrooms – and that’s not a situation you’ll want to stay in for long! You pay more for prestige, whether that’s an Ivy league school or a home located in the best neighborhood. Before taking on “good debt,” ask yourself if you could take on less debt simply by lowering your expectations. Plenty of great doctors have attended state schools, so don’t fool yourself into thinking you have to attend a certain school to get a certain job. What matters more is how successful you were at the school you attended. Sure, the house in the best neighborhood has low crime rates and great schools. But is there another, less prestigious neighborhood that is almost as good, with lower costs? Be sure to factor in all costs; if one neighborhood is significantly further from work, factor in your gas, extra car maintenance, tolls, and any other commute-related expenses. Your mortgage officer will probably qualify you for more home that you can realistically afford – especially if you have childcare costs to consider (now or in the future). Using the budget that your wiser loved ones helped you build, you should determine what amount you can actually afford each month. After considering taxes and insurance, back into a mortgage amount. No matter what, stop yourself from looking at homes outside of this range. Chances are that many of those homes are better than the homes in your chosen price-range (after all, they’re more expensive). That means there are better odds that you’ll fall in love and buy something that you can’t comfortably afford. Whether we’re talking about mortgages or student loans, carefully consider whether you want a 15 or 30-year mortgage. The longer the term, the lower your monthly payment will be, but the more money you’ll pay in the long run due to interest. If you can finance your home for 15 years instead of 30, you’ll have plenty of room for your dreams well before you retire. Likewise, it’s very tempting to request a 20 year student loan repayment plan, but if stick with the standard 10 years, you’ll be off traveling the world before you know it. Specifically for mortgages, be careful about buying a home if you don’t reasonably think you’ll be in the home for at least 3 years. You’re unlikely to pay off much of your mortgage in the first 3 years, and the value of your home won’t rise much, either. If you sell your home, you’ll have to pay all the closing costs out of your meager growth, and you might end up losing money. Obviously, we can’t predict the future, but if you’re a bit of a nomad, you might want to rent for a while. Oink Money guarantor loans are suitable for anyone without a credit history, for example a first time borrower. These are great for debt consolidation, and a friend or family member can increase your chances of borrowing. If you find that you can’t imagine living anywhere else, then it’s time to think about buying. Also, if there aren’t many opportunities in your industry in your current area, this is a warning sign against buying a home. If your current company folds or has a large downsizing, you might not be able to find a position nearby (after all, your coworkers will be applying to the few positions nearby). If your company is a major employer for the area, this is a bigger red flag. If they were to shut their doors, your entire company will be left looking for work. Houses will go up for sale, but who will buy them? Regarding student loans, do you really know what you want to do with your life? If not, figure that out before you start taking out student loans. lunteer. Do whatever it takes to figure out what you want to be “when you grow up”. Otherwise, you might take on debt that your future career can’t sustain. For example, if you start school with a desire to be an engineer, but end up wanting to be a journalist, your future earnings just took a major hit. If you’ve spent years borrowing money, assuming your engineer’s salary could pay it off, your journalist paycheck might not go as far as needed. Borrowing without a good plan for the future could turn life into a nightmare. If you borrow wisely, mortgages and student loans can absolutely help you afford the life of your dreams. That’s when they become “good debt”. How have student loans or mortgages changed your life for the better (or worse)? How have you planned to pay them off?